In the woods Marburg, Sebastian and John junior greet a fake Mary – Mary’s pulling off Marburg’s trick of being in two places at once. On the ship Mary finds a woodland path (yes, really, lots of woo-woo here) and Marburg’s magical coffin that preserves her immortality inside which are her original remains. She pulls them out – but just touching Marburg’s body peels off her skin and makes her rot until she pulls the body back to the ship and out of the magical woodland. She then appears in the real woodland – Marburg realising too late what Mary was doing – and confronts Marburg carrying her own body. For once Marburg looks worried and shocked. Mary pulls out one of Marburg’s teeth even as the countess threatens her – removing the corpse’s tooth also removes that of the living woman. Marburg goes from threatening to appealing – claiming John Junior is already lost because her beloved devil is inside him. Having escaped, John gets to introduce himself to his evil demon child. 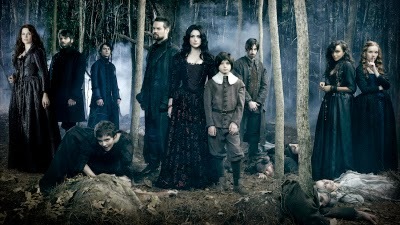 John Alden is joined by Cotton though John has to convince him that the boy is possessed – thankfully evil demon voice, black eyes, gruesome threats and neck snapping are all pretty convincing signs. But this message has been so far lost this season that it feels broken. Freedom for all? What about Tituba, her slave who she continually scorns and accuses because Tituba is doing a tenth to her – her oppressor – what Mary is inflicting on the puritans? She accuses Marburg of wanting a world of slaves without addressing the fact she herself is a slave owner. And what about Isaac? Shunned and outcast but abused by so many? What about Mercy and her abused, powerless followers? She has made many sacrifices along the way – but the only sacrifices she has actually cared about are John and John Junior – sacrifices that personally touch her. Maybe also Isaac, again her friend. But the losses she inflicts on others? The oppression, the slavery, the victimisation she herself inflicts? Ultimately we can be presented with the idea that the powerless and oppressed turn to any method to protect themselves but that same theme presents the oppressed as the oppressor, the victimiser themselves. Maybe it could try for more nuance with more challenges from, for example, Tituba and Mercy (rather than presenting them rather simplistically) to show that just because you’re oppressed doesn’t mean you can’t oppress others – but it has rather failed to do that. I also really do hate how all of Mary’s passion, desire for vengeance and freedom etc are completely destroyed by being a lover or a mother. All the goals that have driven her just crumble the minute these are introduced. She is now willing to sacrifice not just all of those hopes and dreams but her very life for a child she hardly knows and a man who scorns her.